The Valdosta Daily Times (VDT) has apparently decided biomass and real clean energy instead are political issues. As part of the VDT's sudden turn against the VLCIA and its biomass plant, which was provoked by citizen and student activism, the VDT started a week of articles with the headline "Proposed plant said to be 'medical atrocity'", about Dr. William Sammons' Monday talk about health problems of biomass and how solar is better. Why is the VDT suddenly anti-biomass and pro-solar? A growing organization of concerned citizens are opposing the building of a biomass energy plant in Lowndes County. Wiregrass Activists for Clean Energy hope to promote clean and sustainable energies while also educating the public on how a biomass plant could be detrimental to community health. The goal of the organization and the opposition to the plant is not to inhibit economic development but to promote a conversation on sustainable energy, Dr. Michael Noll, WACE president, said. The new organization is not the only one in the community speaking out against the biomass plant. VALDOSTA — As the state and nation look to renewable energy solutions, locally, a proposed green energy plant is causing controversy and raising questions that remain unanswered. The Valdosta-Lowndes County Industrial Authority and Wiregrass Power, LLC are in the beginning phases of developing property for a future biomass electric generating plant. All of the above on the same page. This is not every local elected or appointed official yet; if there are others you want to contact, let LAKE know and we'll go ahead and add them. 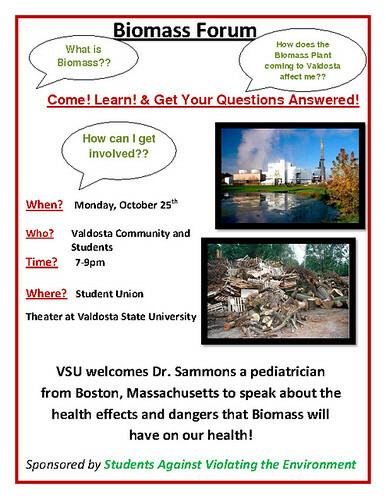 "Proposed plant said to be 'medical atrocity'"
That is the phrase Dr. William Sammons used to described biomass energy plants at Monday night’s biomass forum at Valdosta State University’s Student Union theater. They represent the entire county (including the cities). Anyone can stand up in the Citizens Wishing to Be Heard section of the agenda and say what's on their mind. Say who you are, where you live, and be brief and polite. That's the James H. Rainwater Conference Center, 1 Meeting Place, Valdosta, GA. It's for all candidates: Democrats, Libertarians, Republicans, and non-partisan; for statewide, congressional, and local. Attendees will have the opportunity to submit written questions to be posed to the candidates for their response. 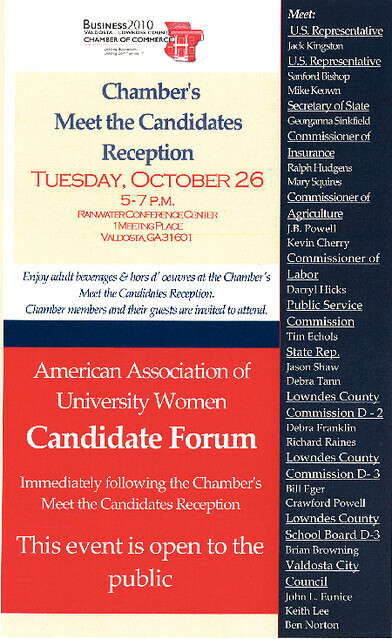 Just before that, the Valdosta–Lowndes County Chamber of Commerce will host a Meet the Candidates Reception, for Chamber members and their guests, 5–7 P.M. Here is a list of the candidates who have confirmed (PDF). America could add 10 gigawatts of solar power every year by 2015, enough to power 2 million new homes annually, industry and market analysts have claimed in a new report. Due to popular demand, the SAVE Biomass Forum has moved to a larger hall, the Student Union Theater. That's on the east side of North Oak Street, across from Baytree Road. It's still Monday, 25 October 2010 from 7 to 9 PM, organized by Students Against Violating the Environment (SAVE) at Valdosta State University (VSU). The featured speaker is Dr. William Sammons, a pediatrician who has spoken nationally on the subject. Forum flyer PDF is available. See SAVE's facebook event page for any updates. 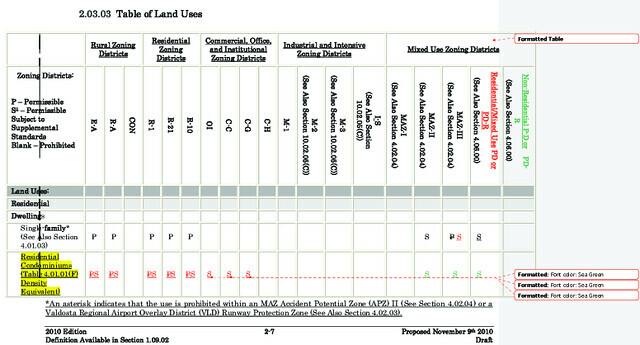 The Technical Review Committee (TRC) has reviewed the ULDC update and has produced a final draft for the Planning Commission, which meets Monday 25 October 2010 at 5:30 PM, still at the old county commission chambers at 325 W. Savannah Avenue.